The campaign for a People’s Vote on the final Brexit deal – versus maintaining the status quo by staying in the EU – is gaining support by the day. But, as the 250 people at Leeds for Europe‘s sold-out ‘Great Northern Stop Brexit Conference’ highlighted at the weekend, we not only have to win a vote, but win the vote. 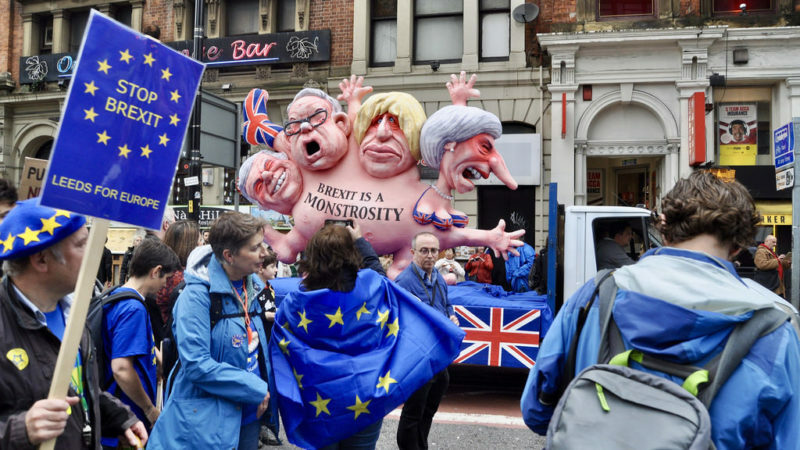 That’s going to require, as the whole theme of the conference stressed, offering a new vision of a different kind of Britain, within the democratic umbrella of the European Union. Offering “no change” isn’t going to hack it, as David Cameron found to his cost in 2016. Understanding what caused the 2016 result is crucial to seeing what needs to be on offer. The top issue, as a survey by Lord Ashcroft showed, is that Leave voters wanted to take back control. And they were absolutely right to want to do so – voters, whole communities and regions, haven’t been in control of their own destiny for decades. Between the first-past-the-post electoral system that meant in the last election 68% of votes didn’t count, to the extreme centralisation of power on Westminster – just ask the people of Lancashire what happened when they said “no” to fracking – to tax dodging by multinationals, people have not been in control. Voters were also expressing their fears about the insecurity of their lives, and their futures. It’s hard to be in control when you are struggling day-to-day, week-to-week with zero-hours contracts, inadequate wages, the threat of benefit sanctions hanging over you, and rents far beyond affordability. So what I posited on Saturday was two key offers our new vision of the UK has to contain: democracy, and security. In Yorkshire, as in the rest of the country, democracy has to mean a fair voting system, for local, national and any other elections. Every vote should count equally, the number of seats should match how people actually vote – that’s democracy. Yet the county in Westminster is broadly into swathes of safe seats for both Labour and Tory. If you’re a voter living in the “wrong” area, you could easily go decades never winning – even at council level – a single representative of your views. But it also has to mean taking back control from Westminster. There’s little general understanding of the fact that the UK is by far the most centralised state in Europe, a fact that has propelled the One Yorkshire campaign. Yet that still hasn’t got it quite right, with the focus on a single elected mayor. How can one person really represent such a politically diverse county? I got one of the biggest cheers of the day when I called instead for a regional assembly as the leadership, a democratic, representative decision-making body. People are hungry for real democracy. And they’re also desperate for the security of a real living wage – not George Osborne’s fake, misnamed provision – and public services for those who need them, which is all of us. Making multinational companies and rich individuals pay their taxes is therefore a crucial part of the vision of a new Britain – and one that is far more likely to be realised within the EU (which is taking real steps in this direction) than as a small island nation of 65 million. An audience member pointed out something else that’s essential in our new vision of Europe – restoring the welcoming tradition that the UK has always provided to incomers. Through projects like In Limbo (which publishes stories from EU citizens in the UK) and through individual testimonies, the conference heard many harrowing accounts of how the Brexit vote has through people’s lives, families, relationships into chaos. And of course we all know about the ongoing Windrush scandal. The demonization of immigrants is closely linked to the lack of security in people’s lives – they’ve been encouraged to blame the wrong source for their problems, when the focus should be on the parasite companies dragging money from communities without paying their way, and governments working for the 1% rather than the 99%. So the next part of this new vision has to be restoring the tradition of welcome that the UK has always provided to incomers. Saying #RefugeesWelcome and #MigrantsWelcome, and celebrating the way free movement enriches all of our lives. This freedom is a two-way street: allowing much richer possibilities for work, for play, for relationships. There were speakers at the conference from not just the Greens, but Lib Dem, Labour, even Tory, and many from no party at all. The current alignment of British politics, like our constitutional arrangements, is well past its replace-by date. Change is essential. Change is coming. And the Leeds meeting offered a positive vision of what that can look like, with the help of continuing EU membership.